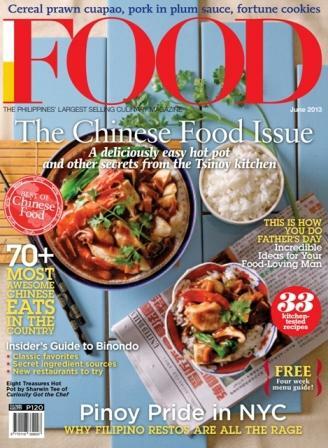 Indulge in China’s food and culture with FOOD Magazine’s June 2013 issue. This month’s pages include features about classic Chinese and modern Asian cuisines, plus everything in between. The "Best of Chinese Food" guides readers on where to find the most delicious Chinese dishes in Metro Manila. Food Magazine also uncovers the secrets of Binondo, the oldest Chinatown in Asia. In the Home Basics section, there are how-to's on making fortune cookies, creating flavorful steamed food, storing Chinese condiments in the pantry and whipping up yummy siopao variants. Plus: Sharwin Tee, host of the Lifestyle Network cooking show "Curiosity Got the Chef" shares contemporary twists on familiar Chinese dishes.